Jaire Grayer, left, of George Mason stripping the ball away from Charlie Brown, center, of St. Joseph’s during the first half last week. You go into a place such as Wichita State or Creighton or Butler, you know it’s going to be a tough 40 minutes in the Midwest. You trail Wichita State by 11 with a little more than three minutes left, ESPN’s win-probability chart says your odds to pull one out have dropped to less than 3 percent. Warm up the bus. Temple saw it differently Sunday, forcing overtime at Wichita State, winning in overtime, improving to 11-3 going into Wednesday’s big Liacouras Center matchup with undefeated Houston. Shizz Alston took over late again, adding another bullet point to his stellar senior resume. Owls guard Nate Pierre-Louis had 21 points, putting him over 20 for the third straight game, and added eight rebounds and two steals. Another winning stat line came from Quinton Rose, who had 17 points, not unusual, but also five assists and five steals. Alani Moore, left, and Nate Pierre-Louis, second from left, congratulating Shizz Alston, right, after he hit a three-pointer against Drexel earlier this season. St. John’s will show up on the Main Line on Tuesday to face Villanova with first place in the Big East on the line. Right now, 2-0 Villanova is the only undefeated team in Big East play, proving every league game will be up for grabs this season. Separate from the standings, put this down as a big-time barometer for the Wildcats, to see whether they can handle Shamorie Ponds and the rest of the talented St. John’s crew. When Penn lost two guards expected to be key performers this season, it seemed reasonable to question how good the Quakers could be. It turned out, good enough to beat Villanova, maybe even be better than last season. More recently, however, we saw the tipping point, where Penn just couldn’t be the same. When senior Max Rothschild went out with a back injury, missing three games, and freshman Michael Wang got injured early at Toledo and then sat against Monmouth, Penn wasn’t the same. The Quakers regularly use three frontcourt players, those two and AJ Brodeur, and with two missing, they simply weren’t very good, getting trounced by Toledo and losing at home to Monmouth, ending any thoughts that Penn might have a shot at an at-large NCAA bid if it doesn’t win the Ivy League. Opening Saturday at Princeton, Rothschild and Wang were back, but again you got more evidence of their importance. Rothschild is one of the city’s great glue guys, a banger who is a terrific passer. His return put Penn back in a position to stay with Princeton, which had just upset Arizona State. This version of Penn-Princeton was no offensive masterpiece. Princeton survived in OT. We’ll argue that Wang’s importance to Penn’s strong season start was made crystal clear when the first-year forward never got in an offensive rhythm in his first game back, making just 1 of 6 shots, posting his lowest KenPom.com offensive rating of the season. This was far from the only reason Penn went down, but we now know Penn needs all its rotation guys to be in sync. Michael Wang, left, getting fouled hard by Saddiq Bey of Villanova on Dec. 11. 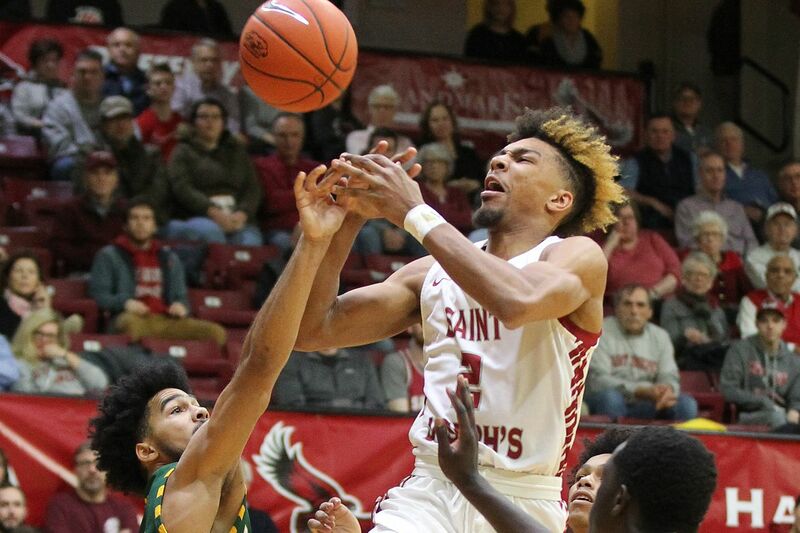 This might turn out be the worst week of the season for any local team: The St. Joseph’s Hawks seemed to have a safe launch point in the Atlantic 10, with home games against George Mason and George Washington, both Georges off to struggling nonleague starts. The Hawks laid two massive eggs, giving up big late runs in both games. Yes, I had it wrong thinking this St. Joe’s team would be right in the NCAA mix this season. To date, not even close. The biggest issue to me is the team doesn’t have the necessary foot speed, especially among the inside players. Watching a GW player drive into the lane and seeing nobody get close enough even to foul on the way to a layup-drill layup tells you enough. Issue No. 2: After Charlie Brown, the offensive options come and go. Fresh Kimble can carry things for a while when he heats up, but otherwise there is no consistent creator putting pressure on a defense. Ryan Daly, the Delaware transfer sitting out, will be that guy next season, but that doesn’t help this season. I took it as a positive sign when Taylor Funk, designated as a shooter on scouting reports, went to the hole a few times in the first half when the Hawks were getting the better of GW. The Hawks just need more of that. The question after the George Mason debacle was whether the Hawks could recover and get stronger. Now? The Hawks are 7-7, 0-2 in the A-10. They are exactly what their record says they are. When you lose your first 10 games of the season, expectations fall accordingly. Even after La Salle beat equally winless Alabama A&M and then Towson the next day, expectations stayed low as the Explorers entered their A-10 opener at Massachusetts. So much for any of that. Final: La Salle 69, UMass 60. One big reason: Saul Phiri and Jack Clark weren’t available at the start of the season. La Salle had some talented players, but there was too much overlap in their talents. Now, Ashley Howard has players with varying skills. Expectations haven’t grown through the roof but are more in line with what you probably expected going into Howard’s first season as coach. Where do local teams fall nationally in free-throw shooting? La Salle is actually second (behind Hofstra), making 79.3 percent. Drexel is 21st, at 76.4 percent. The rest are Villanova 78th (73.3 percent), St. Joe’s 95th (72.8 percent), Temple 130th (71.3 percent) … and Penn easily wins the leaving-points-on-the-table award, at 331st among 353 Division I teams, shooting 62.9 percent. But University of Sciences coach David Pauley gets the award for quickest back-to-back full timeouts, Thursday at Jefferson, two in 10 seconds. Pauley explained that he drew up a play: “I get a 30-foot fadeaway.” Thirty or 23 or whatever, Pauley couldn’t let it go. Let’s reconvene here, guys, and talk about life.